The drive up to Sant’Anna di Stazzema is lovely. The narrow road winds through olive trees, vineyards and pretty villas in the mountains behind Pietrasanta on the Versilia Coast in northern Tuscany. People enjoying the sunny beaches are most likely unaware of the atrocity that occured not far from where they work on their tans. 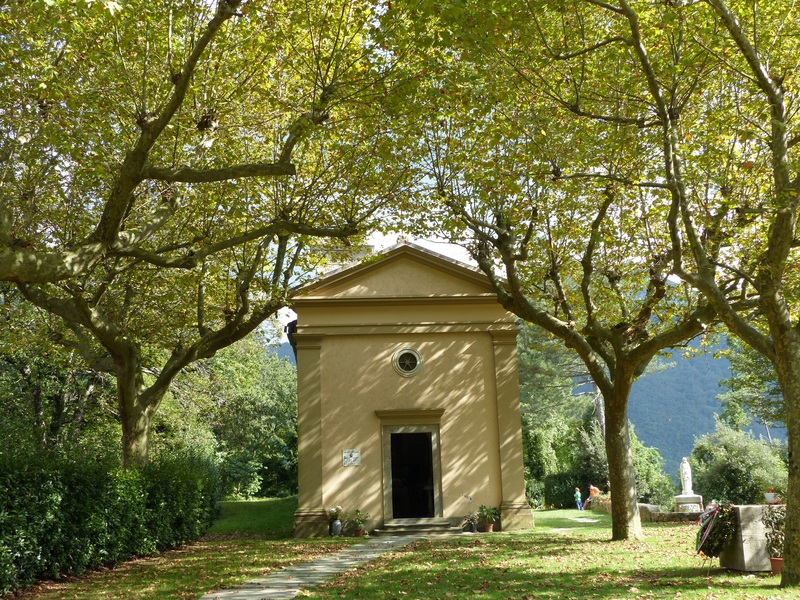 The little church, which was rebuilt after the massacre, sits peacefully under the trees near the Piazza Anna Pardini, named after the youngest victim of the massacre. Anna Pardini was just 20 days old when she was murdered. This is the story as it is written on the information boards at the site. “On August 12, 1944, at dawn, 250-300 SS soldiers, belonging to the second battalion of the 35th Regiment of the Sixteenth Armored Division “Reichsfuhrer-SS” General Max Simon, divided into four columns, and led by Italian fascists, encircled Sant’Anna coming from four different places: three from the mouths of the mountains that surround it, and one low down from Valdicastello, thereby closing every avenue of escape. On that tragic summer, the town had given hospitality to hundreds of people evacuated from the whole of Versilia, and from other cities such as Pisa, Genoa, Piombino. At the sight of the soldiers the men, fearing a raid, went to hide in the woods, confident that in this way nothing serious would happen to their families. Instead that morning Sant’Anna di Stazzema was the victim of one of the most heinous war crimes committed against civilians during the Second World War. The violence of the Nazis went down on an entire community within a few hours over 500 innocent people, mostly children, women and elderly people were massacred; rounded up, beaten, locked in stables or in the kitchens of houses, killed with machine guns and hand grenades. Fire was used to destroy and erase everything: the bodies, houses, barns, animals. Wikipedia adds that Evelina’s baby was cut from her mother’s stomach with a bayonet, pulled out and killed separately . The massacre took three hours. The soldiers then sat down outside the burning Sant’Anna and ate lunch. There is now a Museum housed in the old structure of the village elementary school. After the slaughter only 10 of the 40 children who attended the school were left alive, so over time the school lost its function, and in its place the museum was born. On September 1991 it was transformed into the Historical Museum of the Resistance. In the museum are photos of some of the victims and possessions saved from the fires, photos of events in the area, newpaper clippings of the times and stories by some of the survivors. Possibly the saddest wall is the one with the photos of the murdered children and the pregnant women, and the names of those who didn’t even have a photo to leave behind. At the top left is little 20 day old Anna Pardini. In glass cases are the sad objects found after the massacre. The wedding rings were found in the church square. They were given by the Fascist regime in exchange for gold rings, which Italian families were forced to donate to the nation, to support the war effort. The doll belonged to Maria Franca Gamba, a five year old girl killed in the massacre. When her body was found she was still clutching it to her. Apart from the divisional commander Max Simon (He was sentenced to death for war crimes. The sentence was later commuted to life in prison. 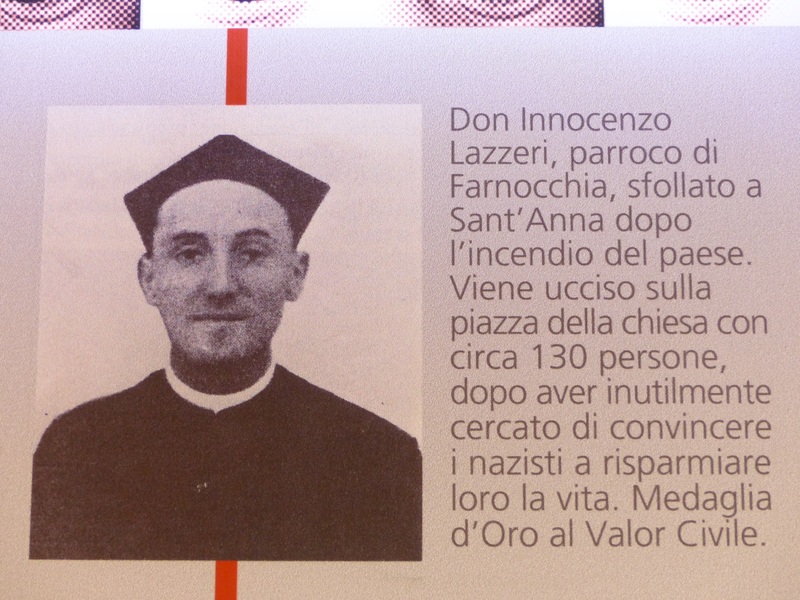 He was pardoned in 1954 and died in 1961), no one was prosecuted for this massacre until July 2004, when the trial against 10 former Waffen-SS officers and NCOs living in Germany was held before a military court in La Spezia. The court found the accused guilty of the participation in the killings and sentenced them in absentia to life imprisonment. However, extradition requests from Italy were rejected by Germany. In 2012, German prosecutors shelved their investigation of 17 unnamed former SS soldiers (8 of whom were still alive) who were part of the unit involved in the massacre because of a lack of evidence. I know that in war it is kill or be killed, but these murdering bastards had wives, children, parents and grandparents waiting for them at home. How could they do this? I wonder if their wives, mothers and children knew what they had done. I hope the killers suffered nightmares for the rest of their miserable lives. I hope they heard the screams and saw the terrified faces and smelled the burning flesh every time they closed their eyes. If only we learned something from this horror, but apparently we don’t. Now we have Syria and other hellholes around the world where the murder goes on. This is certainly not the only atrocity that happened in Italy. As many as 560 people were murdered that day in Sant’Anna. I felt physically sick reading about the atrocities in this beautiful part of Italy. Like you, I can’t understand how these soldiers could massacre innocent civilians in such a cruel manner. Museums like the one at Santanna di Stazzema are important to remember the names of all the folks who died needlessly and to teach us that war is horrible. Sadly, I agree with you, Debra, these lessons haven’t been learnt. Your comments hit hard, rightly so. As awful as it is to know about these events, it is important that they are remembered. Humans will just never learn. What is the matter with our species? It is difficult to believe that such cruelty happens. It seems that dreadful things keep on happening. This is awful, and how the hell did the commander get pardoned ? Like you let’s hope they are haunted by their memories but I doubt it. I can’t believe that he was pardoned. It doesn’t seem possible. At least one of the soldiers did suffer from terrible guilt. He gave evidence at the trial and admitted to killing 20 women. I think when a human being ‘crosses the line’ in the manner in which these murderers did, they can’t ever go back and be fully human again – they are forever abnormal. it maybe that when such atrocities are committed in times of war and in the company of other fighters, some sense of justification can be manufactured but I don’t think a normal human could ever forget what they have done – at least I hope they don’t. It doesn’t seem possible that even in wartime this behaviour is acceptable. I wonder if these soldiers feel powerful killing little children. I don’t know how they can’t see the faces of their own children when they aim their guns. I have heard similar things happen to villages in (then) Czechoslovakia and France, but never in Italy. I’m shocked that even beautiful, idyllic Tuscany could not escape such an abomination. What happened is nothing less than a crime against humanity and it is hard to believe that the perpetrators have mostly escaped justice even till now. The men felt that if they left the village, their families would be safe as it was the men the soldiers were probably looking for. Many of the men would have been away fighting anyway. The whole thing was over in 3 hours. Some may have been able to escape into the woods, but all roads and tracks were blocked, so nobody would have been able to get back to help. It is difficult to believe that people can do these things. What an absolutely devastating thing to have happened to Sant’Anna. Just unthinkable how people could do this to others, yet unfortunately, it happens far too often. It still happens and it seems there is nothing to be done about it. it would be nice if some of those surviving people that were responsible for this would read this and how disgusted people are about their actions. Those men must have had a conscience. What they did must have stayed with them for the rest of their lives. OMG….. and they killed Anna. Not cool Deb…. NOT cool! It is a disgusting piece of history. I visited Syria in 2010, just ahead of the troubles. I often wonder what has become of people we met, especially those who sere not Sunni. I really fear for them. Syria was so religiously diverse then. It seems man’s inhumanity to man will never cease. And it seems both sides have god on their side. It’s been said that more people have been killed “in the name of God” than in all the plagues, natural disasters, and accidents throughout time, combined. This, and other similar events, are truly a sad commentary on the state and enlightenment of the human race. I was brought up without God, and I am very happy about this. What a gripping account of the massacre. Sadly, it seems that in the aftermath of war, little value is placed on human life when the courts and war tribunals deliberate on events which wrecked the lives of those killed, and their families who will forever bear the mark. The thought that the same german ‘soldiers’ who committed this atrocity could be back in civilian life as early as summer 1945, enjoying the liberty and lives with their own wives and children, is an afront to human decency.The pardon is simply incredible. The subsequent decision by the german authorities not to take further action in relation to the other cases is inexcusable. I couldn’t believe it when I read that he had been pardoned. It just isn’t right. That is why I hope that their memories tortured them for the rest of their lives. Debra…..so difficult to read but I am thankful that you shared the story of Sant’Anna. I only wish that historical atrocities like these would not keep being repeated generation to generation. It seems that no lessons are learned from this horror. George Santayana, 1863 – 1952, said, “Those who cannot remember the past are condemned to repeat it.” Unfortunately, this also applies to those who do not KNOW the past, and our schools, throughout the world, continue to teach “revisionist history,” changing or removing the uncomfortable parts to suit their various agendas and salve their consciences. “led by Italian fascists” – did their own people really lead the SS into this unspeakable act of terror and barbarianism? What the hell is in the male psyche that they can commit such disgusting behaviour towards women and children? And they are still doing it! I for one am totally behind ours, and the world’s governments for going into another fight, not of our making, to try and rid the world of thugs who are totally intolerant of how others choose to live their lives and in peace! Such a sad post Debra – I’m still shaking from the thought of those three hours. Hopefully the survivors have been able to live their lives in peace in spite of losing their wives, daughters, mothers and grandmothers. The Italian partisans were known to hide in this region which is probably why the soldiers were there, looking for them. Our village of Vergemoli is just on the other side of the mountain from Sant’Anna and there was fighting there too. I have seen photos of this tiny, remote village being bombed. You have to wonder why. I was outraged by what I saw in the museum. It is incomprehensible that this behaviour goes on. I need to know this place! There is lots of information on the massacre if you look on the Internet. Oh Debra, these stories make me cry… If you/ anyone would like to see a beautifully written/acted/Directed movie on such an event in Italian history. Watch this L’Uomo Che Verra’ (The Man Who Will Come). https://www.youtube.com/watch?v=2DVG7rbAYVA It will bring the toughest man to tears. One can get a better idea on how the Italians lived during WWII in remote mountain villages with the Germans occupying and Italians joining the Resistance against them. This is about a family, their struggles during this period. Its in Italian with English subtitles. I thoroughly recommenced it. I will look for the movie, thank you. There is also a film by Spike Lee called Miracle at Sant’Anna, but it is really about the buffalo soldiers. It is set in this area and refers to the massacre. A similar story was done fairly well with Bruce Willis, called Tears of the Sun, set in a far different land, but depicting equal atrocities committed by idiots with too much power for anyone’s good. TuscanyVillages, thank you for the referral and the link – I will watch it – to remember the past (see quote above). Sadly, the link only takes one to a trailer, not the full movie, and I can’t locate it doing my own search – I just find trailers and segments. Could you post another link, please? Anyone? Perhaps you need to buy or hire the DVD. Hi Debra, firstly I want to say that I don’t know why my reader feed stopped sending me notices of your blog posts. When I realized I hadn’t seen any of your posts in a long time, I did some investigation. The “following” box was no longer checked! Now it is and all should be well…I hope! Very strange! This horrible massacre of innocents is absolutely sickening…how can humans do this to each other, and in such gruesome ways? I had never heard of this massacre until I watched a movie about it. At first, I thought it was a just a fictionalized war movie….and was horrified to learn that it actually took place. I am glad that you went to visit it, despite, I’m sure, being a somber visit. It must be hard to fathom that such a beautiful and peaceful place could hold such a dark past – like so many other places throughout Europe. Thanks for sharing this visit. If only humans could learn from their past and stop these atrocities from ever happening again….but sadly, we all know the reality and it sickens me that some people actually think they are justified in carrying out these tortuous acts in the name of religion. Really? In what religion is the killing of innocents considered good? History really does repeat itself….but I think it should mean that we should learn from our past mistakes instead of repeating those events that cause our civilization to decline. I knew the story so I knew what to expect of a visit there. It is confronting and incredibly sad to be in that beautiful place and to imagine the horror that took place. I am glad I went, these people need to be remembered. Because of my father, I was brought up without religion…I thank him every day for this. What a tragic story…puts me in mind of Oradour in France, scene of a similar massacre….good post, Debra. I’m sure things like this are still happening. When will we ever learn? Hi Debbie. Congratulations on your much deserved nomination for best single art and culture blog for Massacre at Sant’Anna di Stazzema. I visited the museum and memorial at St.Anna some years ago, after I had seen the Spike Lee film. I recommend it as a very interesting and moving visit which focuses not just on the massacre in this village but on the history of the resistance througout Tuscany. The Spike Lee film was also moving, but is different from the real story in that the film implies that it was members of the resistance who betrayed the village. In fact, as you note Debbie it was fascist collaborators. If I remember correctly, the cover up of this event did not begin in Germany. It was fully documented but the documents only came to light in 1990 when they were found in a filing cabinet in Rome which had previously been turned to the wall. By whom?? We don’t know. Although the bodies of many victims were burned in the church, it was not a religious war. It was a war and a massacre motivated by the ideology of fascism. It was a tragic event and the story is well told at the museum. I’m pleased that I went even though it made me furious. I find it difficult to believe that people can do these things, whatever their reasons.Thank you for your comments. Anon Peggy’s statement needs to be qualified. It was motivated much more than just the ideology of Fascism which even had Churchill as one of its admirers at one stage of his political career. It was the ideology of total terrorism and hate for anyone who holds different views. It’s what we saw at Srebenica and what we are witnessing now with IS. It’s a virulent madness which unfortunately could spread everywhere in the world, even here here we live, sadly. Thank you Debra, for your bringing this tragic story to your readers. The same tragic event took place at Marzabotto north of Florence. This unspeakable three day butchery of innocent Italian civilians is well documented in a book by Jack Olsen called “SILENCE ON MONTE SOLE”. Thank you, I will look for the book. My visit to Sant’Anna di Stazemma made me furious and sad. How do people do this to each other. Early Thursday AM Wee hours onApril 13th, 2017 AD, Shell Beach , Calif.
nightmare last week when “our” new American warmonger Secretary of State Rex Tillorson while at the G7 American Puppets Summit laid a hypocritical wreath there on behalf of Newbie Shabby Goy Donald Trump’s Apartheid Israel’s “Big Colony”, the murderous Zionist OWNED Israeli Occupied JewMerica, ZOGUSA, the greatest terrorist nation ~ since Hispaniola in 1492 and after Saint Augustine, Jamestown and Plymouth, since 1898 on the worldwide stage when we took the show on the road in seizing Spain’s Empire right after Enslaving the Kingdom of Hawaii in 1893. What a hypocrit this DISGRACEFUL “man” is criticizing the murder of helpless civilians and babies as he represents the most criminal murderers in history! L’Chrime!! !